The Honolulu Chapter’s annual Hearts of Gold fundraiser featured butterflies, damsels in distress and an ARCS Scholar alum who is coming to their aid. Dr. Will Haines, who received the 2006 Maybelle F. Roth Award in Conservation Biology, described his efforts to increase populations of rare and endangered Hawaiian insects through captive rearing and breeding. “Many of Hawai‘i’s 6,000-plus unique arthropods are rare or endangered, so there is no shortage of endemic species for captive breeding,” Haines said. He focused on Hawaiian lepidoptera—butterflies and moths—while doing his doctorate work in entomology at the University of Hawai‘i at Manoa, and headed the Pulelehua Project as a junior researcher there. 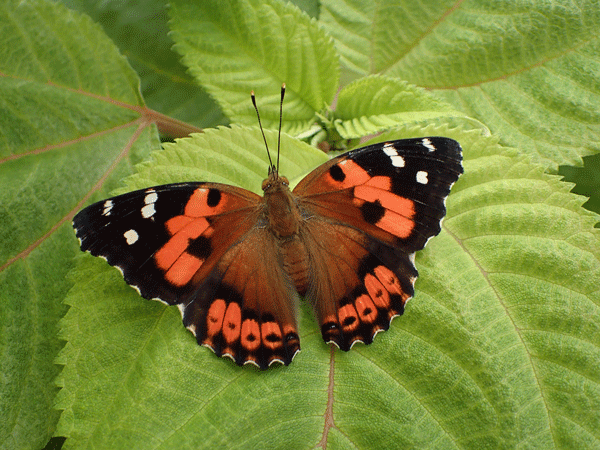 “Pulelehua” is the Hawaiian word for butterfly. Focusing on the Kamehameha butterfly, which is the state insect, the project used a citizen science campaign to map populations and identified key threats (primarily invasive ants). Haines is continuing his work as manager of the Hawai‘i State Department of Land and Natural Resources insect breeding program. In his talk, Haines described the 45-day lifecycle of the rare butterfly from an egg the size of the head of a pin to an adult, which has coloring reminiscent of the more commonly seen monarch butterfly. In keeping with the Valentine’s theme, he provided a glimpse into butterfly courtship. (They turn romantic about sundown, get frisky and chase each otherabout, then settle down into a trance.) Scientists release the males and place the females on mamaki plants, where they lay as many as 200 eggs, which hatch out into eating machines. “I think they're cute,” he said, sharing videos of caterpillars chomping their way through leaves watermelon-slice style, “Velcro-ing their butts” to a stem and wriggling out of their skin in the final molt to chrysalis stage. After emerging, adults are placed in a butterfly house, where they feed on Gatorade and mashed fruit in preparation for release into the wild. The Orangeblack Hawaiian Damselfly is more coy. The petite dragonfly-like insect favors the banks of streams and ponds and doesn't breed in captivity, so Haines collects egg-containing plant stems to rear in the safety of the marsh-based breeding facility, free from the threat posed by introduced fish during their water-dwelling naiad stage. “In four months, 10 stems can yield more than 500 naiads,” which are fed brine shrimp and mosquito larvae, he said. The damselfly was placed on the Endangered Species list in 2016; only one population is known to exist on O‘ahu, and Haines hopes to preserve it from extinction. “It’s always a treat to see the positive work done by scholars we have supported,” commented ARCS Foundation Honolulu Chapter President Patty Lee. A canvas print and mousepad set featuring Haines’ photos of the featured insects were among items offered in a silent auction to raise funds for 2017 ARCS Scholars, and Lee presented an ARCS Anthurium to donor Glenda Rother. 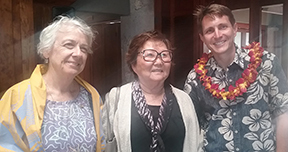 Also in attendance at the luncheon were ARCS Scholar alumna Philomene Verlaan, an ocean policy expert, and Caroline Uehara, wife of the late soil scientist Goro Uehara, the Honolulu Chapter’s 1993 Scientist of the Year. Dr. Haines is a graduate of UH Manoa’s College of Tropical Agriculture and Human Resources (Plant and Environmental Protection Sciences) and the interdisciplinary Ecology, Evolution and Conservation Biology graduate specialization program. His ARCS Award was funded by an endowment established by intrepid traveler and Spanish scholar Maybelle F. Roth and managed by Hawai‘i Community Foundation.